In-stream projects are designed to restore stream function by capturing gravels, increasing off-channel habitat, and increasing channel complexity. Our primary approach is to slow water down by adding roughness — either accumulations of large wood or arrangements of boulders. 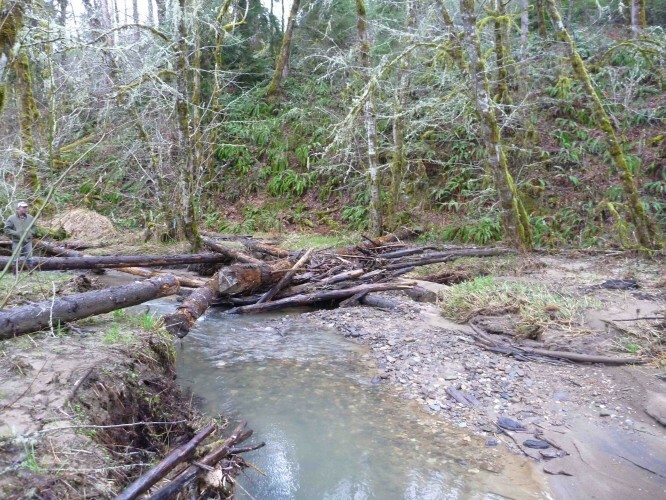 Strategic placement of large wood or boulders leads to gravel accumulation and sorting, increase in stream bed elevation leading to better connectivity to the floodplain, and back-watering of off-channel habitats such as side channels and alcoves. Most of the work happens during large storms, as was the case at this site on Duffy Creek. A large flood in January 2012 increased woody debris deposits and created high quality cutthroat trout spawning and rearing habitats.